Discover a world of privacy and tranquility and uncover your personal slice of paradise. 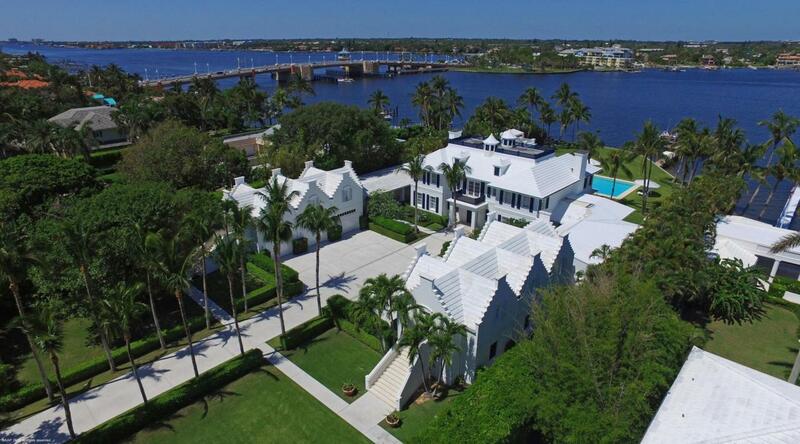 Located a block from the Atlantic Ocean and walking distance to The Eau Palm Beach Resort and Spa, this gorgeous estate straddles Hypoluxo Island and provides a 360 degree view of the Intracoastal, from sun rise to sun set.A row of stately palm trees welcomes you to this French Colonial style residence with Dutch influences. The full two story front facade, covered by a hip roof with deck, introduces the balanced layout through the vertical repetition of the window lining and gabled dormers. Carefully constructed details, harmonious design, and outstanding views bring all the spaces of this home to life.The graceful floor plan, filled with symmetry, repetition of architectural elements anconcept of March, easily guides you throughout the home from one space to the next. The foyer, with its custom coated aluminum railing and spiral staircase, is the pivot point for all the activities of the home. The double height living space opens up to the exterior waterfront through a tripartite series of arched and rectangular window frames. The love for interior design is evident in this estate through the precision in detailing. Great attention is given to all details and custom work, from utilizing various materials including wood, stone and marble, to elaborate wall and ceiling finishes. The custom kitchen features a vaulted ceiling, handcrafted cabinets, and a unique Irish soapstone waterfall center island. The unique, curved French Doors mimic the vaulted rotunda ceiling of the casual dining area and provide a panoramic view of the private backyard, poolside and Intracoastal beyond. The grand staircase leads up to the master suite, which opens to a balcony with breathtaking Intracoastal views. There are 4 additional bedrooms in the main house, ideal for family members or guests. A series of small balconies enhance the ambiance by extending the edge of each room, merging interior space with exterior. Two private pathways within the garden link the main house to the two separate guesthouses each with private entries, 2 bedrooms, 1 bathroom, living space and a kitchenette. The third guest house is privately located on the east parcel and has two bedrooms, two bathrooms, a full kitchen, laundry and living room.